Twentieth Century-Fox's 'The Omen" starring Gregory Peck, Lee Remick, David Warner, Billie White-law and Patrick Troughton opend in 1976. Directed by Richard Donner and written by David Seltzer, "THE OMEN" was produced by Harvey Bernhard with Mace Neufeld as executive producer. Charles Orme was associate producer. 'Til man exists no more. Many Biblical scholars have noted that these conditions can be slotted into our times-now! The Jews have returned to Zion. A comet has swept across the skies and as for the rise of the Roman Empire, scholars have interpreted that as the formation of the European Common Market. What if these signs did indeed signal the coming of the Anti-Christ through whom "Satan would wage his last and formidable offense?" How would the fact of his being the son of Satan be concealed until the right moment? To whom would he be born - or placed with - until he reached manhood? What would the consequences be to the people who raised him thinking he was an ordinary child? And how would his being in a position of ultimate worldly power be assured? 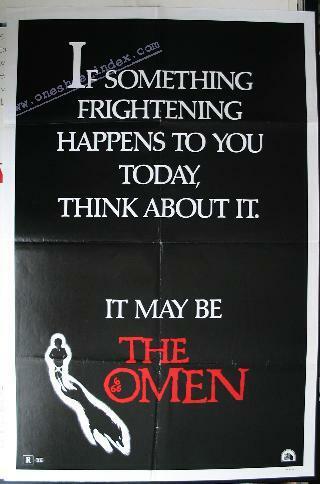 Drawing on these questions, "THE OMEN" is an ultra-suspenseful mystery thriller which remains true to its source. Gregory Peck who in recent years has turned his energies to film production with 'The Trial of the Catonsville Nine" and "The Dove" returns to acting in the role of the Ambassador to the Court of St. James. Lee Remick is his wife, caught up in a web of seemingly inexplicable tragedies. British star David Warner is a press photographer who stumbles upon a frightening clue to mysterious events. British actress Billie Whitelaw is Mrs. Baylock, nanny to the five-year-old son of the Ambassador who arrives unannounced from "the Agency" and presents herself to her new charge with the chilling words: "Fear not little one. I'm here to protect thee" Patrick Troughton is the priest who tries in vain to warn the~ambassador. And Holly Palance, daughter of Jack Palance, makes her motion picture debut as a young nursemaid. Principal photography on the film continued for eleven weeks on locations in southern England with brief visits to Rome and Jerusalem for key exterior sequences.